Kilnbridge is a multidiscipline construction and engineering business specialising in structural works packages and with dedicated business units in concrete cutting, demolition, fabrication, fire protection, post-tensioning and waste management. We work on projects and contracts throughout London and the UK and our head office and plant and equipment service K-PLANT is based in Cody Road Business Park in East London. Since achieving our FORS accreditation we have increased safety measures, improved efficiency and reduced fuel consumption amongst our fleet of vehicles. We were initially notified about FORS by our clients, who advised us that we should be compliant with the standards that the scheme promotes. After looking into FORS further and studying the requirements to join, we quickly realised that FORS would assist us in highlighting the best practices that we employ and lowering our fleet expenditure through advanced and beneficial fuel saving techniques. We successfully passed our initial FORS Bronze audit at the first attempt in 2010. Aside from demonstrating that we had an effective Occupational Road Risk Policy, the experience highlighted the range of training opportunities, best practice advice and safety, efficiency and environmental protection insights available that we were immediately keen to utilise to help us improve further. 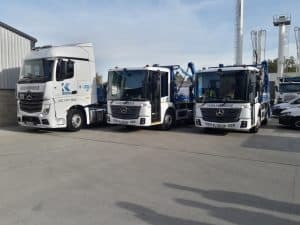 We therefore began to take advantage of the recommendations provided coupled with the tools and training that FORS offers and working to achieve our Silver accreditation by incorporating measures to improve fleet safety such as Blind Spot Cameras, Side Under Run Guards and Audible Warning Alarms. We also installed a vehicle telemetry system for our fleet which enabled us to monitor real time environmental factors such as idling, fuel consumption and CO2 usage as well as driver behaviour. ‘We identified that policies, procedures and safety devices alone would not protect vulnerable road users.’ – Martin Scott, Health, Safety, Environmental and Quality Director. In addition, we installed forward facing cameras in our entire fleet in order to obtain 360° footage from all vehicles as part of our overall safety strategy. The cameras continuously record footage, which has helped us to review accidents and driver behaviour in conjunction with vehicle telemetry. This footage and data is also used as part of our Driver Education Programme to deliver toolbox talks and improve driver awareness and behaviours. As well as improving the safety of our vehicles on the road, the availability of this footage has significantly reduced the time required to process insurance claims and associated costs as well as assisting the business in defending bogus claims. ‘Camera footage is used to produce driver toolbox talks to educate and develop driver awareness whilst improving behaviours.’ – Thomas Barrett, K-PLANT Director. However, we identified that policies, procedures and vehicle safety devices alone would not be sufficient to protect vulnerable road users. As a result, in order to achieve Gold we introduced many of the training resources available through FORS (including SUDS, LDT and SAFED) into our Driver Training and Development Programme. This was supplemented by members of our Management Team undertaking the FORS Practitioner modules to help maintain and further develop our policy and systems to retain Gold accreditation. Since achieving Gold in 2016 we have continually reduced both our CO2, Particulate Matter and NOx emissions and fuel use, despite completing approximately 20% more deliveries in London during this period. This has been achieved through our meticulous planning of routes and regular tyre pressure and wheel alignment checks, which has assisted in reducing our carbon emissions. Courtesy of the increased safety measures and improved driver standards, the number of accidents per 100km and PCNs our vehicles have been involved with have also decreased (see table). Driver health and fitness: All employees are required to fill out an Occupational Health questionnaire and we actively promote the Government’s Cycle to Work scheme in order to endorse a healthier lifestyle throughout the organisation. All of our drivers are also registered with Constructing Better Health’s Medical Review Programme. Driver recruitment strategy: In order to encourage new and young drivers towards the industry we target local schools and colleges through recruitment drives and attend careers fairs hosted by them. Noise reduction: In order to manage the noise pollution created by our vehicles, our HSE&Q department annually review our environmental impact to suggest guidelines for safe and efficient working practices in our transport operations. Modal shift: We have centralised delivery and scheduling through our Logistics Co-ordinator to reduce vehicle movements, utilise telematics to plan routes, avoid congestion and keep journeys as straightforward as possible. We also operate a car sharing policy, promote the use of public transport and aforementioned Cycle to Work scheme and use conference calling software to minimise our environmental impacts and reduce fuel usage and CO2 emissions. For the near future, our plans include further efforts to focus on and protect vulnerable road users and beginning to use our new 15-strong fleet of Mercedes Econic HGVs. The Econic chassis is most commonly seen on bin lorries, although we observed that they have advantages when used as a 18T Beavertail for deliveries around London. This is mainly due to increased visibility of vulnerable road users, thereby increasing cyclist safety. The vehicles also allow drivers to enter and exit from both sides of the cab, which is a safety benefit when delivering machines onto a busy street. We are one of only a few companies in the UK that have them and their Euro 6 emissions standard and low entry level cabs further highlight their suitability in assisting us to make continual improvements to our vehicle and fleet performance. We would be proud to be accredited to FORS Gold as it would represent the considerable improvements we have been able to make to our fleet’s safety, efficiency and environmental impact and work we will undertake to maintain and enhance these standards in the future. It would also underline our dedication to road safety and continually improving the skills and performances of our workers to ensure that our fleet and its operations are an asset to the company which regularly achieve exemplary levels of best practice. to go from strength to strength. Driver health and fitness review – our company continues to actively screen all new starters and as we class our Sales Lorry Driver role as ‘safety critical’ the annual health assessments (external specialist) remain ongoing. This process has enabled us to identify some underlying health issues with our drivers and therefore we have been able to proactively support where possible on an individual basis. 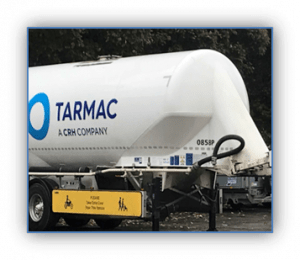 Strategy for recruiting drivers – Whilst Tarmac C&L have a very high Driver retention rate, we supplement driver shortfalls by the use of an agency service. 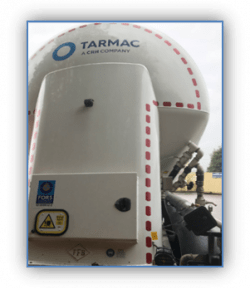 Tarmac C&L operates a strict policy to develop and upskill all new drivers through a structured two week development and assessment programme supervised by one of our six in-house driver trainers. This covers training in all of the key competences regarding vehicle manoeuvring, familiarisation, Safe and proficient driving, telematics amongst many other items. Once the new driver is signed off as competent to drive for Tarmac C&L they will participate further in ongoing assessments as part of our ongoing driver training process. Noise assessment – The FORS standard has guided our focus and awareness on the need to minimise noise pollution across our operation. Whilst a robust process has always been in place for our Plants and Terminals a greater level of focus was identified across our Logistics operation. 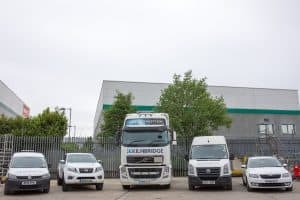 This has resulted in further surveys, awareness training and updated procedures within our driver handbook in order to continually improve our environmental performance. As a business we continue to improve efficiencies and in particular investigating potential alternative modes of transport is a key factor within our ongoing Logistics development strategy. This is achieved through detailed modeling and cost analysis, which has resulted in a significant increase in our rail footprint in recent years. Building on the Euro VI fleet procured in the first 2017, additional Tractor Units to the same high specification have been added to our fleet. In doing so we also took the opportunity to ensure that the highest environmental and safety features were incorporated into the specification through our procurement teams. 2018 also saw the introduction of the ‘People Panel’ side under run safety board, which incorporates the warning information to Vulnerable Road Users. All safety features and other compliance requirements are audited through a random spot-check process ensuring that the high standards that we have set ourselves are maintained.